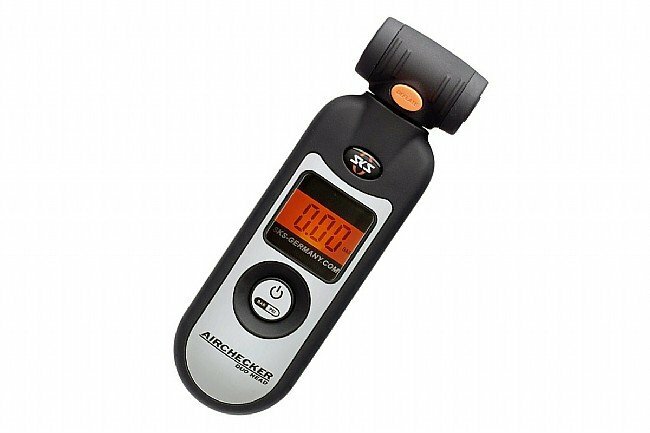 The SKS Airchecker offers convenient digital precision for fine tuning the pressure of your tires. An oversized back-lit digital display shows either bar or PSI readings, and a handy reduction button allows you to lower pressure in incredibly small increments. The Duo Head is compatible with Presta and Schrader valves and rotates 180 degrees to fit virtually any wheel. The SKS Airchecker measure 4.5 inches long, easily stows in a medium sized saddle pack and is extremely lightweight at 45 grams. Measures 0-140 PSI/10 Bar. Includes battery and storage case. 35 x 11.5 x 2cm. Now own two of this product both have the same fault one from BTD, one directly from SKS. Both read the pressure just fine, but when you use the pressure bleed adjustment button the air comes out but the pressure reading stays the same. You have to remove the gauge and then put it back on the valve to get the new reading. Great In Every Except One! Love it except for the fact that it turns itself on in my jersey pocket so keep a spare battery handy! I used this to check the air in my bike tire. I killed my Topeak D2 tire sealant, so wanted to try something else, sounded good, liked the idea of a light. It never worked right from the start, was nothing but trouble, set it back and wrote a bad review that wasn't used, hope this makes it, save you from return shipping. BTD didn't have the D2 so got it else where, it works, no sealant. got 2 of these last Christmas, gave them as gifts, both came back in Feb. I tried both on several Presta and Schrader valves, neither was trustworthy. If you knew approx what the pressure was, you could pick one of the multiple different readings presented by these little hummers. IMHO, the ones I got were worthless. I'm running tubeless tires and lowering air pressures so I wanted a precise air gauge to keep track of the pressures I start the ride with. This SKS airchecker digital is the ticket. OK gauge for my fat bike. I needed something that worked with my new Mukluk to measure low tire pressures and this fit the bill. The beeper is pretty weak and the reduction button doesn't seem to do anything, but maybe that's a low pressure thing. It's usable. Easy to use, lighted display. Like the bleeder button. It's German. What would you expect? ,-) Nice to be able to quickly check my pressures without using the pump. More precise this way too as it measures in the tire not the pump cylinder (as pump gauges do). Works, but sometimes hard to read. I picked up one of these when I got a fat bike. It gives air pressure in 0.5 psi increments starting at 0 psi which it good to for the low pressure fat tires. I use it every ride. It beeps when it has registered the air pressure which is a nice feature. I have two primary gripes. One is that in some combinations of lighting and positioning the display is not readable. I may have to rotate the wheel around and adjust my head to see the numbers. Second is I sometimes find I'm in the wrong mode (bar vs. psi). It has a one-button control which is both on-off and mode switch. This plus being hard to see means I do some extra pumping and deflating some days. PSI good, display not so good. The first few times of use, the Airchecker worked ok. The display was not quite showing all the digits, but a tap on it brought them back to life. After a week, the missing digits would not come back to life, and the readout was undecipherable. I am returning the defective item.